South Africa has a coastline that stretches approximately 3,100 km and lies at the southern tip of Africa, bordered by Namibia and the Atlantic Ocean in the west and Mozambique and the Indian Ocean in the east. Mangroves do not occur directly adjacent to the nearshore environment due to the high-energy state of the South African coastline. They are restricted to areas of low wave energy with lower salinity, these conditions are found in estuaries. All mangrove forests in South Africa are restricted to estuaries. Forests are usually fringing the estuary banks in fairly narrow strips that are frequently inundated with tidal waters while landward areas may remain dry for long periods of time. 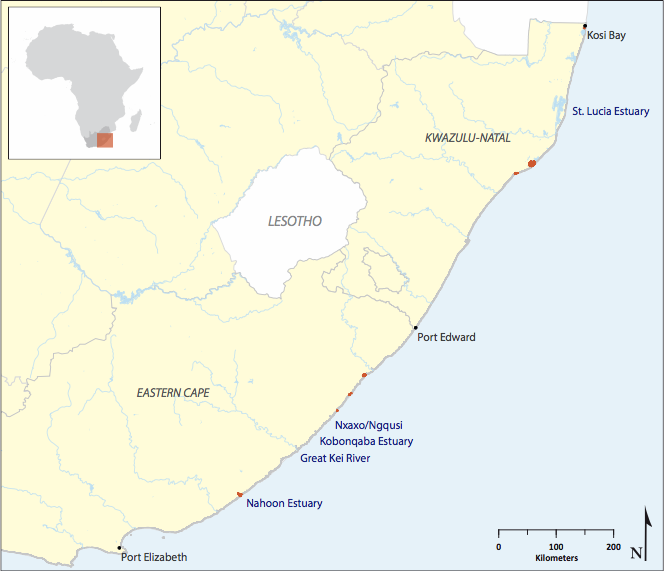 The distribution of mangroves in South Africa stretches from Kosi Bay (27o S) in the north with the southernmost mangroves occurring at the Nahoon Estuary in East London (32o S). The largest mangrove forests are found in the subtropical areas at Richards Bay and St. Lucia in KwaZulu-Natal (KZN) and reach their distributional limit in the warm temperate zone where the forests decrease in cover and species richness. There are six mangrove species in South Africa; Avicennia marina, Bruguiera gymnorhiza, Rhizophora mucronata, Ceriops tagal, Lumnitzera racemosa and Xylocarpus granatum but only three are widely spread. While the area of mangroves has increased in the country many forests still face threats such as harvesting, livestock browsing, disturbances from agriculture, bait harvesting, freshwater abstraction and pollution. This leads to a loss of both flora and fauna abundance but most noteworthy is loss of mangrove habitat. Overall interventions for the conservation of mangroves should include directly protecting near – pristine mangroves, protecting the hydrological regimes supporting these ecosystems, promoting natural regeneration for self-renewal and enforcing mangrove buffer zones are important to allow forests to thrive in South Africa.